When seventeen-year-old Sia wakes up on a park bench, she has no idea who or where she is. Yet after a week of being homeless, she’s reunited with her family. At school, she’s powerful and popular. At home, she’s wealthy beyond her dreams. But she quickly realizes her perfect life is a lie. Her family is falling apart and her friends are snobby, cruel and plastic. Worse yet, she discovers she was the cruelest one. Mortified by her past, she embarks on a journey of redemption and falls for Kyle, the 'geek' she once tormented. Yet all the time she wonders if, when her memories return, she’ll become the bully she was before… And if she’ll lose Kyle. Imagine waking up on a park bench, unaware of how you came to be there, and the only indication of who you are, is the playlist on your iPod. Sia comes to the horrifying conclusion, why can't she remember anything? Her reflection indicates that Sia is in her late teens, attractive, but since she's only armed with only her iPod and skimpy gym clothing, she soon realises that the park won't hold the answers she seeks. She's tired, hungry and has no idea where to go. So she runs. With no identification, no purse or money, Sia stumbles upon a good samaritan... Or so he seems. She won't be able to go without sustenance for much longer, and accepts his offer for a free meal from a sidewalk vendor. But the offer isn't without strings. Her refusal at his suggestion of paid employment, leads to her kidnapping, but when instincts kick in, Sia is able to escape and is now on the run for more than one reason. The call of shelter is too great, and Sia desperately needs rest, joining a group of homeless that have settled under a bridge for the night. Luckily Sia finds Carol, a homeless woman who takes Sia under her wing. The mean streets of Los Angeles are no place for a young woman on her own, especially when groups of teenage boys set upon the defenseless on the streets, maiming and potentially killing for no other reason other than they can. After being recognised in a soup kitchen and abused, Sia wakes up in hospital, having been hit by a Taxi. The hospital knows who she is and has located her frantic parents. But what do you say to the two strangers that claim they're your family? Sia is diagnosed with Dissociative, or Fugue Amnesia, a rare case of temporary memory loss that is caused by stress. But Sia's life is seemingly perfect... But as they say, looks can be deceiving. Sia is a mean girl... Or was. Her life has been a series of snide remarks, cruel taunting and social standings, only she can't remember a thing. All she knows now is that she isn't that girl anymore, the girl that fellow student Kyle, chased from the soup kitchen. Sia distances herself from her cruel clique, including Stacy, her best friend and fellow cheerleader that is now benefiting from Sia's social demise. But Sia is on a mission, she wants to be a better person, and what better way that to help fund raise for the recently homeless victims from an earthquake. Using her father's wealthy contacts, Sia helps Kyle gather support from celebrities and the Hollywood elite, while her relationship develops with the kind hearted Kyle. But with Sia's memory still not returning, he can't allow himself to fall for the reformed mean girl, fearful that she'll revert to her former self when her memories return. When Sia's memory does return, will she be able to hold onto the new life she's created... Including Kyle? 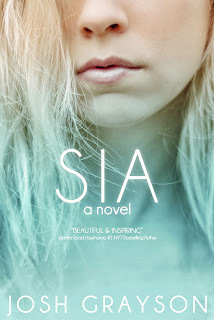 Sia was the story of a girl who used a traumatic event, to change her life for the better. Her memory loss is devastating, but the insight into life on the streets, truly is unimaginable. The down and out people that Sia's situation introduces the reader to, are realistic, but charming. Carol literally changes Sia's life. A woman who lives each day not knowing where she'll sleep, eat or if she'll survive to see the sun rise, and she takes Sia under her wing and protects her against the unforgiving street life. My heart bled for Carol, she was warm and kind hearted, and I wanted to hear more of her story. It's the ultimate story of the popular rich girl being served a huge dose of reality and being able to start her life again, the way it should be. A brilliant debut for first time novelist Josh Grayson, who isn't afraid to create raw characters and confronting situations. Thank you to Josh for providing me with a review copy. Josh Grayson was born in Mexico, raised in Massachusetts, and now lives in Martinsville, Virginia. It was his move to the South that stirred his imagination and gavehim the courage to start writing. During his free time, Josh enjoys reading, jogging,swimming, and watching YouTube videos. Josh currently works as a medical driver, shuttling people all over Virginia and North Carolina. He has also worked as a machinist, film sales rep, administrative assistant, and telemarketer (he apologizes if he called you).